When I was a kid, I wanted more than anything to be a cartoonist. My favourite TV show was Simon in the Land of Chalk Drawings, a cartoon about a boy whose drawings came to life. I read the local library’s entire collection of Peanuts cartoons, and every other comic strip I could get my hands on. I started drawing my own comics in the squares of old out-of-date calendars. I loved drawing and I loved making up jokes. Like a lot of people do, I lost track of that childhood dream somewhere along the way, and I found myself working in an office instead, doing decidedly uncreative things. Under the glaring fluorescents, my penmanship deteriorated and I forgot how to draw. A few more years passed, and I started getting migraines. Lucky for me, creativity is a bit like a stubborn weed that won’t die: the roots run deep enough that it will keep growing back under the right conditions. 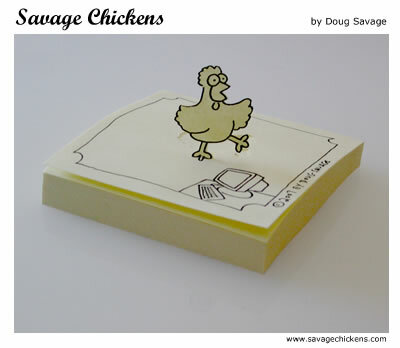 One day, when I was sick of working overtime and I’d had one migraine too many, I drew two chickens on a sticky note. Quickly I learned how important it is to have a creative outlet in life. I haven’t had a migraine since 2006 (knock wood) and I’ve got the best work-life balance I’ve ever had. And hey, look at that. It turns out I’m a cartoonist, after all. I love drawing Savage Chickens. Besides the cartoons, I’m exploring all kinds of other creative things, like animation, sculpting, and painting. I’m trying new things all the time and loving every minute of it. So I guess my motto is, start now, you never know where it will lead. I’m happy to do more interviews, time allowing – give me a shout and we’ll sort something out. I’ve been making more public appearances lately. For information, see my Events posts. If you’d like me to appear at your event, contact me.